I'm a sucker for any product that promises to neutralize, I really am. 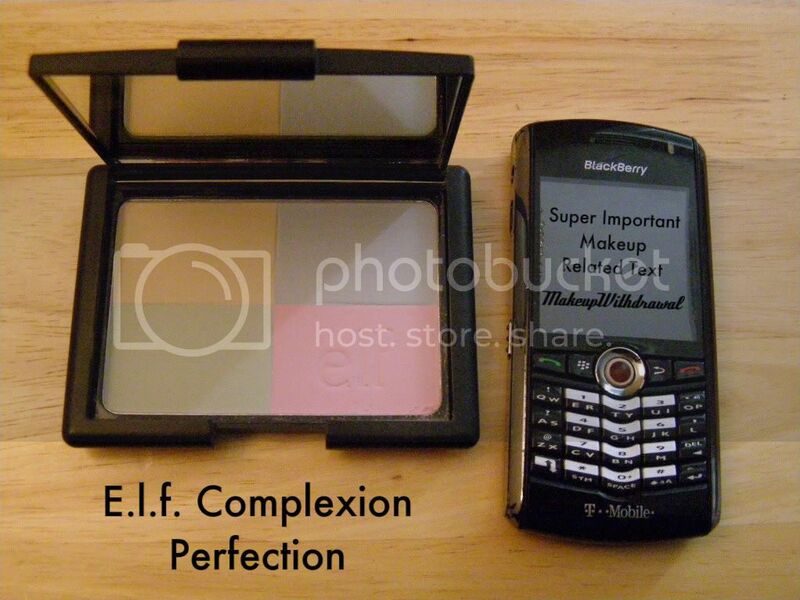 I've been curious about this product in particular for a long time- the E.l.f. 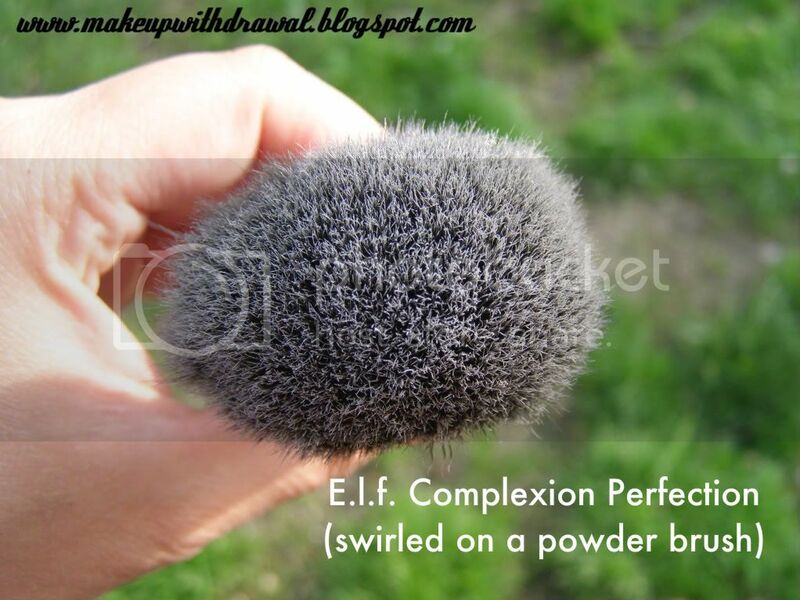 Complexion Perfection (hence forth known as 'elf' because I'm tired of typing the periods). This product is from their Studio line - you know, the one where everything is packaged in imitation NARS. It's a pressed powder divided into four quadrants, all pastel (which reminds me of Easter, baby animals and toddlers every time I open it). The powder is finely milled, scentless, and neither hard to get on a brush or overly powdery. 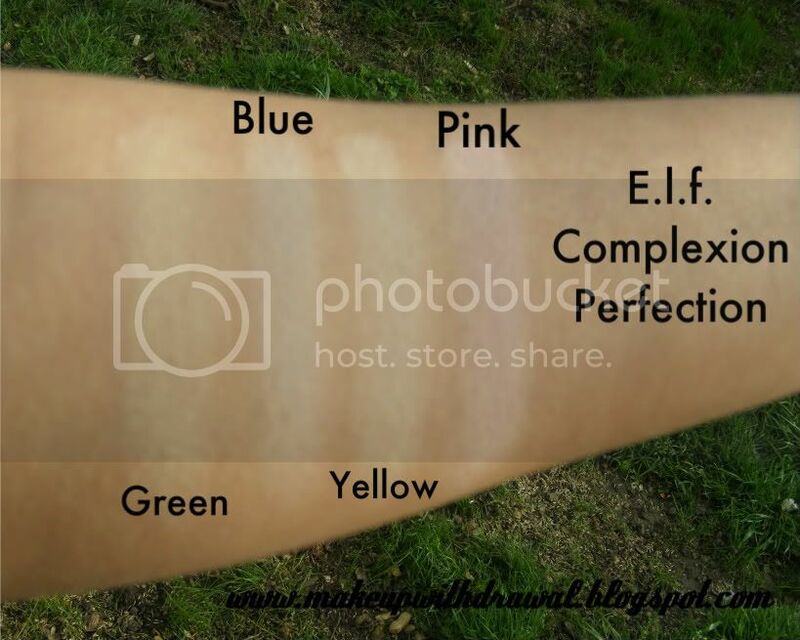 I swiped each color individually, just to give you an idea of how it looks but be aware that I swatched it really heavily. I tried using this power in a few different ways. First, on my bare face (cleansed and moisturized, of course) I applied it directly to my face with a small fluffy brush. I used the green around my nose where the skin is always red, a little bit of both the pink and the yellow under my eyes, where there's a bit of darkness. I didn't really notice any difference, except that there was now powder on my face (not really worth taking a picture of either). Next, I tried the same thing on top of concealer and foundation. Voila! The yellow+pink combo underneath my eyes set the concealer nicely, and seem to brighten the area. The green around my nostrils helped tone down any remaining redness peeking through my foundation. However, my favorite use of this product is to swirl all the colors together with a big fluffy brush and apply it as a setting powder. I was also fascinated that all the colors mixed together made a sort of 'non color', if that makes any sense. No one shade was predominately noticeable over the others. That combined color helped brighten my face up (great for sallow complexions) and mattified the oily areas- I'll definitely be using this more and more as it gets warmer out. I did notice that on some of my drier areas, it seemed to accentuate the flakes though, so be wary if you have dry skin. Yes, over applying this powder will give that ghostly pale pallor, so for the darkest skin tones- I wouldn't recommend this, I'd imagine it'd be more ashy than useful. On lighter complexions, use a lighter touch and you'll be all set!